One of my favourite haunts while in Chennai is Amethyst. This 100-year-old colonial mansion set in a leafy garden is a green, peaceful oasis of calm in this big, dusty and noisy city. 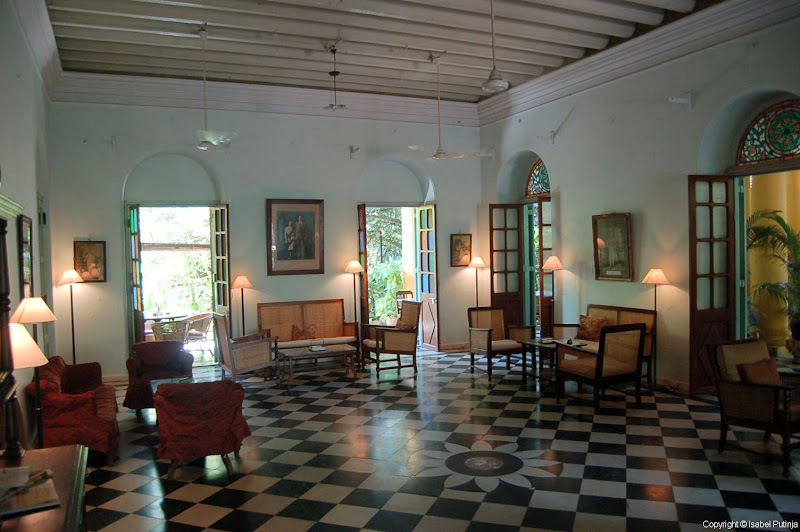 The lounge, veranda and gardens have been transformed into a café and restaurant where you can sit among potted palms with a good book, a good friend, or your laptop, as there’s free wifi (something which is still rare in India). They have yummy homemade cakes, which are also difficult to find. On the ground floor there’s a boutique with (pricey) indo-western designer wear and jewellery. There’s also a flower shop selling exotic plants. Service is a little patchy. There are plenty of waiters but somehow they don’t see you, or forget they’ve taken your order. All the reason to stay a little while longer. Mosquitoes are regular visitors, day and night, so repellent is a must! Despite the unreliable waiters, the pricey menu and biting insects, I’m a daily visitor while in Chennai. I just wish there was something similar in Bangalore. Or maybe not – it makes a trip to Chennai a little extra special. Open every day from 10am to 10pm. Wonderful photos. I'll visit often. I visited recently and the wifi is no longer free. They are now charging 30 Rs /hour. The connection was also horribly slow... I guess I won't be spending my mornings here anymore. Not only do I love Amethyst, I was just dreaming of it the other day! Pity about the Wi Fi. Visited this place once, and jus fell in love wth this place..Wifi, never cared for it.. Sad news... this place is closed for good. Apparently the property is up for sale! Amethyst has moved to a new location but the old ambiance is gone!